Continuing on the theme at the end of last month, here is a list of blessings for each day in February. The more you look for them, the more you find. Seeing animal footprints in the snow that ran along the edge of the sidewalk and driveway. Administration is a Spiritual gift. Safe drive home in the fog. God’s mercy – His love covers a multitude of sins. Colors in the ice that forms when water seeps from the rocks along the highway. Great blue heron flying by the window, about 30’ away. Driver who warned me of deer crossing the road. Breakfast with a friend and she treated after finding extra cash in her purse. Seeing a product, designed by a former classmate, in the local grocery store on the end of the aisle (http://www.ecozip-bags.com/home.html). 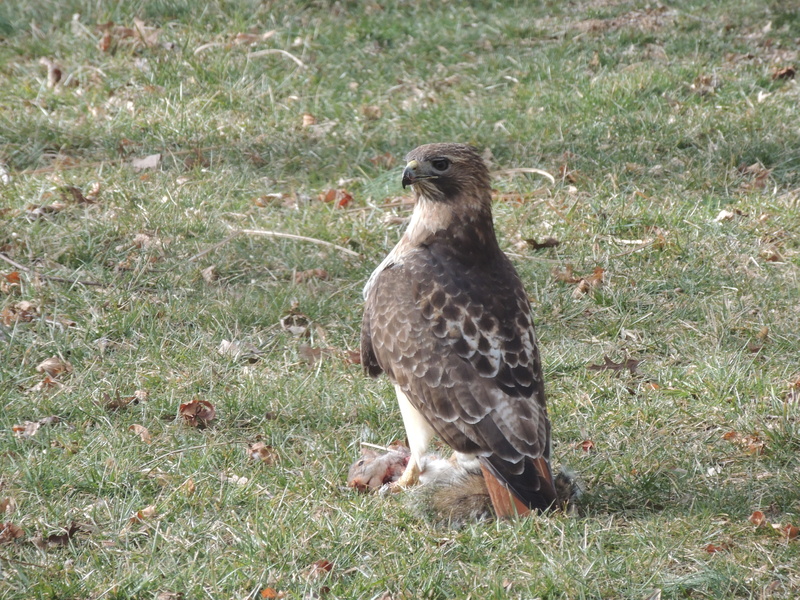 Capturing a photo of a red-tailed hawk that recently caught a squirrel. Finding extra discounts on things I needed to order or buy. Having more energy and less appetite, being a walk away from things I used to overeat on. Going through a trial and then being able to use the lessons learned to help others. Staying healthy when others around you have been sick. Opportunities to learn new skills and try new jobs. The person who makes a small statement that gets you back on track. Seeing young children learn to help others. A walk in the cool air and bird watching. Tests that can help diagnose problems while they can still be treated. great list, thank you – I am encouraged to write my own! Love is list. What encouraging list.